The winter blues won’t make their way to Montreal this season with so many holiday sights to see and activities to do. You may want to stay in your condo and curl up by the fire, but a quick glance at the city’s festivities and you’ll forget the chill in no time. Walk down the streets and you’ll see bars alight with crowds of revelers getting ready for the season, while Christmas lights, trees and decorations can be found on just about every corner. Whether you want to do something romantic with your loved ones, friends or family, there are plenty of options at your fingertips. For instance, at the Parc Olympique, there will be a free skating rink, complete with free musical performances, holiday activities and Christmas trees. With such a large venue, the event is sure to be packed with people and holiday cheer – and lots of skating too. There are also rinks at Bassin Bonecours in the Old Port, and at Lac aux Castors at Mont Royal Park. Likewise the skating pond at Parc La Fontaine attracts many families who love to take in the beauty of the outdoors, while Atrium Le 1000 nearby offers some of the best indoor facilities in the city. 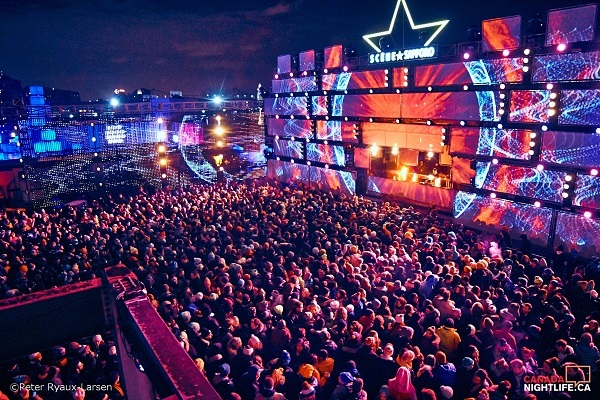 In the Old Port of Montreal, Igloofest one of the city’s largest music festivals, will take place throughout January and February. As the name suggests, the festival will feature ice-sculptures, an igloo village, and music from international DJs. An annual event, thousands of revelers will take part in the party, and heat up icy atmosphere in no time. Don’t forget all the foodie events too. Condo owners living in Mile End can enjoy the Mile End Foodie Tour, while people all around the city can take part in Montreal en Lumiere, which offers food events and tastings in almost every neighbourhood. For those who love getting outdoors, there is cross country skiing at Mont Royal. Bring your own, or rent from one of the assigned stations and you can make your way down and around the city’s most famous mountain and views. Les Amis de la Montagne and many parks throughout the city also have great snowshoeing and cross country skiing paths too. So forget the cold slump and celebrate the snow this season. Montreal is a city of joie de vivre and you should get out there and enjoy it!